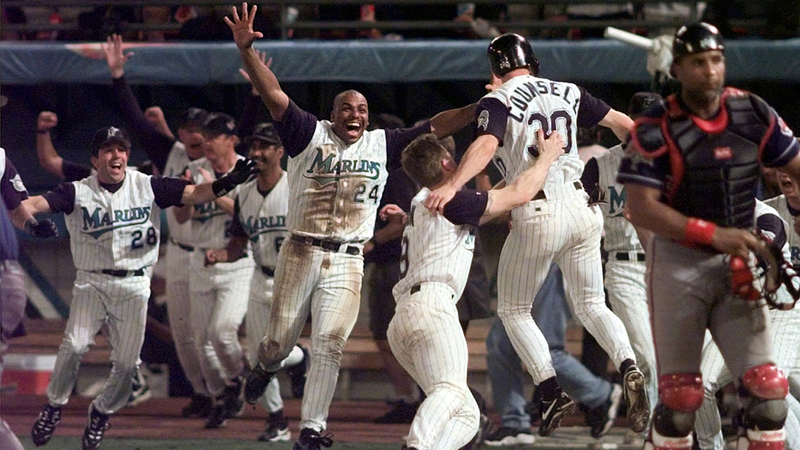 In Game 1, the Marlins grabbed a 5-1 lead in the fourth when Moises Alou and Charles Johnson hit back-to-back homers, Alou's coming with two runners aboard. Florida scored two more in the fifth, and hung on for a 7-4 triumph. Both clubs opened Game 2 with single runs in the first inning, but that was all the Marlins could manage against Tribe starter Chad Ogea and a trio of relievers. Meanwhile, the Indians scored four in the fifth on four singles, two more in the sixth on Sandy Alomar's two-run homer, and evened the Series, 6-1. Game 3 was slated for Cleveland, where wind-chill readings in the 20s figured to make things tough for the hitters. Instead, it was the pitchers who had problems, and the score was 7-7 after eight frames. And in the top of the ninth, the Marlins scored seven runs, thanks in part to three Cleveland errors, three walks and a wild pitch. The Indians made things interesting with four runs off closer Robb Nen in the bottom of the ninth, resulting in a 14-11 final. Right fielder Gary Sheffield led the Marlin attack with three hits and five RBIs. Game 4 witnessed the first World Series snowfall since 1979. Cleveland rookie Jaret Wright pitched six strong innings, Manny Ramirez and Matt Williams both chipped in with two-run home runs, and the Tribe cruised, 10-3. In Game 5, Orel Hershiser was roughed up again, allowing six runs in five-plus innings. Marlins starter Livan Hernandez, who beat Hershiser in Game 1, picked up his second Series victory, 8-7, despite allowing seven hits and eight walks in eight-plus innings. Once again the Indians mounted a furious ninth-inning rally, scoring three runs only to fall short. Just as Game 5 mirrored Game 1, Game 6 matched Game 2. Chad Ogea and three relievers permitted but one run, and the Indians captured a 4-1 decision. In Game 7, Tribe second baseman Tony Fernandez opened the scoring with a two-run single in the third inning. The Marlins scored a run in the seventh, then one more in the ninth on Craig Counsell's sacrifice fly to force extra innings. And in the bottom of the eleventh, Florida won the World Series when Edgar Renteria's two-out single plated Counsell, who had reached base on a Fernandez error. Just four years after their birth, the Marlins ruled the Major League Baseball world.